Another Midwest Coatings Seminar has come and gone. If you missed the opportunity to join us this year, here’s a snippet or two on what you missed! Does your curing oven maintain the same temperature throughout your Production day? How often do you need to test the cure? How do you test the cure? These are just a few of the questions that our friend and colleague Kevin Biller aka “Joe Powder” answered in detail at the Midwest Coatings Seminar 2014. 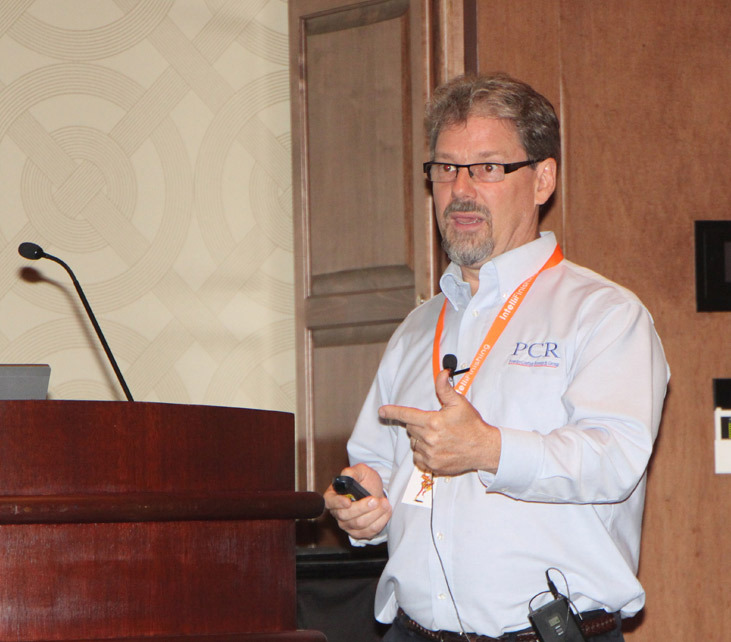 Kevin was one of the guest speakers for our event this year, and is the President of Powder Coating Research Group. Have you ever seen “orange peel” or cratering on your powder parts? Craters can come from many sources in your paint shop. Do you have any of the following located in or near your paint lines? Hygiene products – lotions, creams, etc. Crater contaminates normally occur BEFORE the powder is baked. Introducing a few key procedures can reduce and prevent these issues. Would you like to subscribe to receive information about upcoming seminars? Follow this link intellifinishing.com/mcs. IntelliFinishing hosted our annual Midwest Coating Seminar in Tulsa, Oklahoma at the Hard Rock Hotel and Casino. We had a great time (didn’t lose much money) and learned a great deal from Kevin Biller of The Powder Coating Research Group and Mike Dilday of Fanuc America Corporation. Many companies from a variety of industries including: aerospace, oil and gas, custom coaters, custom fabricators, construction equipment and ag equipment manufacturers, were present. With all of the recent innovations with powder coating and robots used in the finishing industry, we provided a 10-minute introduction to the flexibility that an IntelliFinishing system has to offer. Process changes and product changes are easily adapted with our unique friction conveyor (power and free alternative) and smart controls with recipes for your variety of parts. A video from an active powder coating system job site was also provided, www.intellifinishing.com/construction. Kevin Howe, IntelliFinishing’s project manager, gave a brief tour of the progress and discussed how the customer was implementing the project in phases. The first phase features some manual pull sections, with most of the system automated. A second phase will later be implemented with more automation and the addition of an automated wash system as their production increases. Since our conveyor has no chain, additions and modifications can be accomplished without affecting production. Even though Doug warned the audience they would be stuck for hours listening to the commercial, like they do in the timeshare industry, Kevin Biller, from The Powder Coating Research Group, was introduced after the short 15-minute introduction. 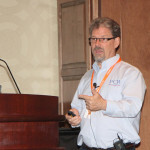 Kevin Biller’s presentations, “Introduction to Powder Coating Technology” and “Recent Innovations in Powder Coatings Technology”, followed Kevin’s philosophy of formulating – Simplicity + Quality. Kevin’s presentations were easy to understand (even if your last chemistry class was in high school and they only thing you learned there was how excited your chemistry teacher became when you figured out alcohol was flammable). We look forward to hosting another seminar and if you would like to receive notification of our next one, click on SUBSCRIBE. The main thing about working with powder coating formulations is to avoid band-aids and to start with the right stuff based on your product’s requirements. The low temperature cure discussion included information about the latest in UV cure as well. Powder is applied electrostatically, melted at 212-248ºF, then cured with UV. An example was provided of the use of a robot to provide the UV cure. Members of the audience were excited about this development and could see the impact this innovation could have on manufacturing and assembly of their products. Powder on plastic or other non-conductive substrates was also explained and its potential for revolutionizing the industry. After lunch, Mike Dilday from Fanuc America Corporation demonstrated and presented the use of robots in the powder coating and liquid paint systems. During lunch, he shared videos of robots used in paint systems. Robots have traditionally been used on liquid paint lines and recently, the number of robots used in powder coating is growing. Robot usage continues to increase due to demand for better quality, more flexibility and quicker return on investment due to decreases in robot prices. Robots also improve throughput, emissions compliance and are ergonomic. Mike Dilday reviewed when to use robots. Implementing robots can provide a high return on investment due to labor savings, material savings, reduced warranty claims, increased production and throughput. Customer requirements for implementing a robot in your paint system are one dedicated robot operator per shift, knowledge of managing the liquid or powder spray system (robot technical knowledge can be taught) and consistent part presentation (the most important aspect).